In a nationwide effort to reduce the number of accidents and fatalities among West Virginia teen drivers, the state has initiated a Graduated Driver Licensing (GDL) program. Under the GDL, teens that are beginning their driving journey in West Virginia must reach certain milestones prior to getting an unrestricted driver's license. The first step on your path to your West Virginia driver's license is to obtain your instruction permit (learner's permit). Below you will find everything you need to know about the process, including what documents are required, and your instruction permit restrictions. (800) 642-9066 (WV residents only). If you're new to West Virginia and you have a permit from your previous state, the time you spent in the out-of-state GDL program will be credited towards your WV instruction permit, as long as you present a current driver record when you begin the application process. For more information, please see our page on WV driving records. NOTE: West Virginia provides both standard instruction permits and federal identification (REAL ID) permits. Successfully pass the written test. A completed Application for driver's License or ID Card (Form DMV-DS-23P) with written consent from a parent or legal guardian. A Driver's Eligibility certificate issued by your county school board. This form certifies that you are attending school and making forward academic progress. Proof of identity (birth certificate, valid U.S. passport, Consular Report of Birth Abroad). Proof of Social Security number (Social Security card, W-2 form, 1099 form). Proof of legal name change, if applicable (certified birth certificate, court order with name change). 2 documents of residency (WV bank statement, paycheck that shows your current address, Social Security benefits letter). The WV DMV requires 2 documents proving TN residency for “Not for Federal Identification” instruction permit the same as it requires 2 documents proving TN residency for “For Federal Identification” (REAL ID) instruction permits. These residency proofs must show your name and physical address. For more information about these documents, please refer to this list of acceptable proofs. NOTE: West Virginia does not currently require teens to complete driver's education in order to get their license. HOWEVER, if you successfully complete an approved Driver's Ed course, you will be exempt from the behind-the-wheel requirements listed below, as that practice driving time is incorporated in the course curriculum. It's also important to note that a Driver's Ed course will make you a far smarter and safer driver, and better prepare you for the driving environment. For more information about driver's education, please visit our Driver's Ed in West Virginia page. Once you have gathered all the necessary documents, it's time to take your written test at a Division of Motor Vehicles (DMV) Regional Office or any DMV Exam Center. The written test is based on information about state-specific traffic laws, road signs, and safe driving techniques discussed in the West Virginia Driver Handbook. You'll learn things like safe stopping distances and right of way. NOTE: If you choose a "For Federal Identification" (REAL ID) card, the WV DMV will issue you a temporary license while you're at the office and mail you a permanent card within 15 business days. 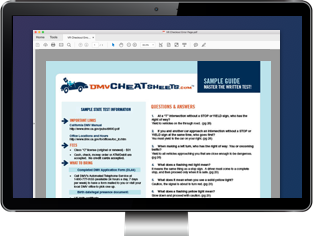 To help you prepare for the written exam, the DMV provides a basic practice test. If you want to ensure passing on your first try, our certified partner offers comprehensive online practice tests. Complete 50 hours of behind-the-wheel (BTW) supervised driving. 10 hours must be during the evening. Log your hours on a 50-Hour Certification Log (Form DMV-10-GDL). Must be logged and certified by your parent or guardian. Note: Remember, if you complete an approved Driver's Ed course, this driving time will be incorporated into your curriculum. You must be accompanied by a licensed driver 21 years old or over. You may only drive between the hours of 5:00 a.m. and 10:00 p.m.
You may only have 2 passengers that are not immediate family members in addition to your supervising adult. All occupants must use safety belts. No cellphone use, including texting. You must follow a zero tolerance alcohol policy. If you need to replace your instruction permit, the process is pretty simple. Just bring the proof of identity, Social Security, and residency documents mentioned above with you to your local DMV Regional Office. Now that you're ready to continue your journey towards being a safe and responsible driver, your next step in the GDL process is to get your intermediate license. For more information, please refer to our Teen Driver's License page.